At the core of our business is our commitment to supplying our clients with exceptional service and superior quality products at competitive prices. 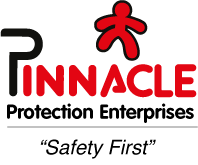 Over the past decade Pinnacle Protection Enterprises has expanded its product range through continual innovation, expert knowledge, key supply chain networks and greater understanding of our customers. This has allowed us to provide a unique range of products better suited to meet our customers’ needs and enabling us to provide value-added services. Our extensive product range has been determined by comprehensive research, development, innovation and meaningful insights into each of the markets in which we operate. This is clearly demonstrated in a range of products that enrich food safety programs, whether it is basic legislation compliance or enhancing your certification. Health and Safety of the workforce is created through the supply of safety products that assist in reducing workplace injuries, and full compliance and traceability by certification bodies. As the leading African manufacturer, importer and distributor of high quality disposable hygiene and safety products, Pinnacle Protection Enterprises has embarked on corporate social investment (CSI) initiatives aimed at achieving and sustaining long term positive social development to the communities in which we do business. Pinnacle Protection Enterprises is, without a doubt a world class operation which will continue enhancing its market position through continued investment in its People, Technology, Systems, Quality, Service and Innovation.